CM Magazine: Mystery From History. "So"---Katie turned to her parents---"does this mean we aren't in trouble?" "We'll talk tomorrow morning," added their mother. She turned to Rusty. "Your parents are coming over too." "We'll be there," said Sheila's mother. "We need a plan to get these kids safely through the summer." "No fair!" Katie protested. "We should be treated like heros! We solved a crime that goes back over a hundred and forty years! The police never did find out who robbed MacDonald's Bank or where the money went! And we found Sir Charles Matthews too! He must have fallen into the escape tunnel and got stuck! Elizabeth said he was portly! And we know what happened to Elizabeth! And what about the art theft?" Her dad seemed unimpressed. "Even heros have to pay the price for their misdeeds," he said. And that just about sums it up! It leaves out the starting point of the 140-year-old house with its sufficiently scary reputation for being haunted that even its windows have remained unbroken over the years, the creepy chief of police and his shady ancestors, the rescue at sea of the two girls from their disintegrating raft, and a lot of atmospheric details, but it certainly gives the results of Katie, Sheila, and Rusty's investigations. There are a few too many coincidences for the story to be completely convincing. When the children are doing some library research on the old house, they just "happen upon" the stories of ship wreck and bank robbery that later are found to be relevant to the ghosts in the house. Rusty turns up a letter in the Matthews' archives that "just happens" to mention a tunnel under the house. Katie "just happens" to trip in the tunnel at a point where she falls on a corner of Elizabeth Matthews's diary which "just happens" to report all the details of the construction of the tunnel and the robbery of the bank. There are no insignificant details and no irrelevant or misleading clues. In this, it has much in common with the Nancy Drew mysteries of fifty years ago. And like those stories, there is never any real doubt as to just who the villains in the piece are. 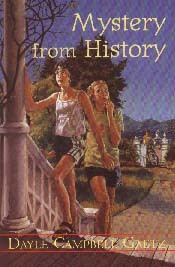 Also like Nancy Drew, however, is the fact that young girls in particular will find it an engrossing and exciting read with enough historical background to give it a bit of substance. In that, it is an improvement on Nancy Drew! Mary Thomas works in two elementary schools in Winnipeg, MB, and can't help liking a book which contains a librarian who sparkles with energy and who treats children's requests for information on the neighborhood's haunted houses with respect.